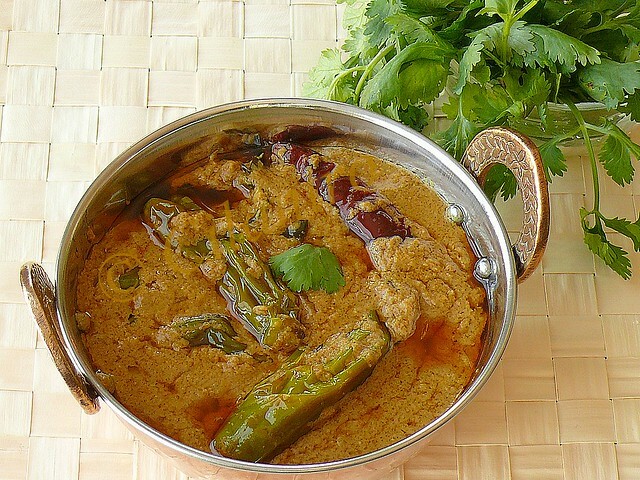 Mirchi Ka salan is a recipe for all chilli enthusiasts like me. A very famous dish from Hyderabad from where I grew up and a great accompaniment to Briyani, Mirchi ka Salan may sound very spicy but actually it is not. It depends on the variety of chilli peppers used. The peppers blend well with peanuts and sesame to give a nice milder creamier taste. A little elaborate procedure but worth the try~do try it on days you feel like staying in the kitchen for a longer time or on days you want to impress your friends or your other half. Slit the peppers lengthwise ( do not cut them into two ). In a kadai/fry pan heat a tablespoon of oil and sauté the peppers until the oil is well coated and the skin starts to wrinkle ( Take care not to burn them ) . Set this aside. Add another tablespoon of oil and add the peanuts and roast for about 3 minutes then add the sesame seeds and sauté until the crackle. To this add the coconut and sauté until the coconut is dry with no moisture. Cool and grind to a fine paste. Extract tamarind pulp and set aside. Heat about 4 tablespoon of oil and add the seasonings , then onions and sauté until soft and they turn light brown in color. Now add the curry leaves and red chillies and sauté for few seconds. Sauté the ginger garlic paste for another few minutes and add all the powders. Mix well and immediately add the ground masala, tamarind extract and ½ cup of water. Bring the mixture to a boil and simmer with lid closed for a good 10 minutes stirring occasionally ( the masala will tend to splatter so be careful when stirring). Add the sautéed peppers when oil starts to separate and mix well. Now add salt and simmer again for about 5 minutes. 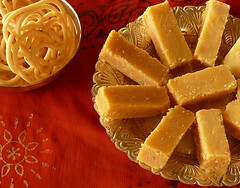 Serve with Biriyani, Nan, Paratha or Chappatis. TIPS: I have used Korean Pepper for this recipe but you can use any long thick green chilli variety like the Hatch Peppers, Jalapeno, Yellow Wax. The Korean Pepper is not at all spicy but gives a nice chilli flavor. If the chilli variety is spicy then omit the red chilli powder in the recipe, also remove the seeds. Add water only if the tamarind extract is thick. Typically the peppers are deep fried in oil but I choose to pan fry them. This is one of my favorite dishes. I love to have this with naan. One of my fav Hyd curries, I adore this dish. Looks delicious. this is one of my fav hyderabadi recipes, i make this very often. ur curry has come out really well! 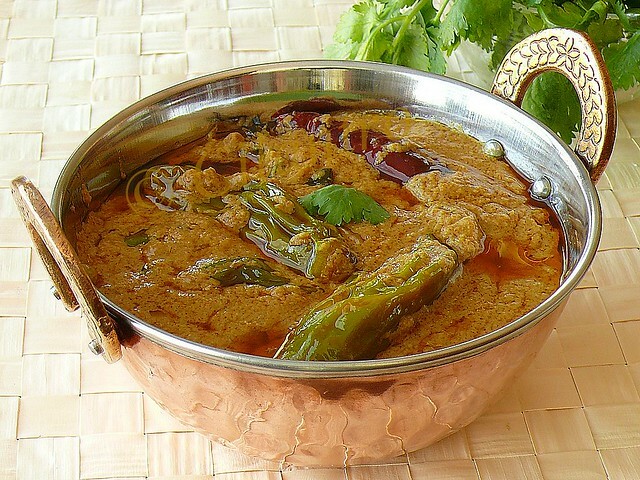 Slurp, wat a beautiful looking mirchi ka salan..
wow, looks super delicious !!! Looks really delicious and spicy Salan! so yummy n inviting !! Looks so yummy and with peanuts, coconut and all sounds so good. Wow this looks so mouth watering.I badly wants some of that. Delicious!! I just love this dish - been ages since I made it!! Look at that dish. Yummilicious to the T. :-). reminds me of my age-old days spent in Hyderabad. OH! This looks lipsmacking good!!!! I have never made this at home. only dig in in the restaurants. it looks yummy..I need a bowl of Biryani now..
looks fantastic.. great pics too.. lovely blog! hey, I tried this out today.came out excellent and the taste was good.hubby liked it a lot.but i didnt get your colour, mine was on the pinkish side.came back here to see what i missed and realised that i missed turmeric :). thanks for the recipe. Thank you Sumi for your wonderful feedback. I am glad your family liked it. I have added turmeric and chilli powder since my peppers were almost sweet, if you have`nt added both then I think it will turn out in the color what you got. 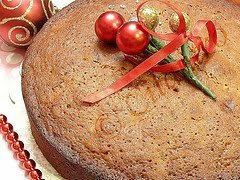 Hi, my name is Marimi and I come from Spain, I am visiting you fantastic your fantastic blog, this recipe looks delicius. Geetings from Spain Marimi. Beautiful mouth-watering pics! Great recipe...I'll definitely give it a try! This looks so tempting! Lovely pictures. Enjoyed going through your blog. Made it today accompanying peas pulao. Wow! It came out so deliciously awesome. Everybody loved it. Thanks for a great post.